Duran Duran are suing their own fan club for breach of contract, claiming that it did not pay the band its promised revenue. In 2010, the group signed a contract with Worldwide Fan Clubs, Inc., based in a town about 30 minutes outside of Chicago, that guaranteed the band 75 percent of all profits, according to Chicago Sun-Times, while the company kept the rest. Although part of the suit alleges that the company failed to keep precise fan-club records, collect membership fees and keep accurate accounting, Simon Le Bon & Co. claim that the company owes them approximately $40,000 in damages. The company was also supposed to serve as a warehouse that would sell band merchandise. The Associated Press reports that Worldwide Fan Clubs had no comment on the matter. Currently, Duran Duran – whose membership remains the same as their 1981 debut minus guitarist Andy Taylor – are working on a new album with a little help from former Red Hot Chili Peppers guitarist John Frusciante. "We are all such big fans of John's work and are honored to have him adding his magic to the record," the group reported in a blog post. "There are no current plans for John to tour with us, but his guitars sound incredible on the tracks." It is unclear how much of the album the guitarist will play on. 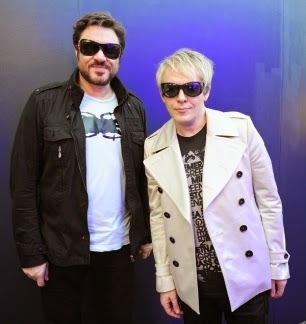 UPDATE: The band has issued a statement, noting that "Duran Duran value and respect their many fans around the world and feel compelled to correct the media's misrepresentation of its lawsuit against Worldwide Fan Clubs, Inc. The Band emphatically states that the lawsuit is not against its loyal fans but simply seeks to protect its rights against the company that formerly managed its fan club." The group added that it has stopped outsourcing its fan community.